What we have here is a significant reworking by The Audio Files (a Berkshire based analogue front-end specialist) of the Audio Technica LP5 turntable, which is one of numerous models manufactured by Hanpin in China using one of two basic direct drive motor assemblies coupled with whatever ancillaries Audio Technica, Denon, Technics, Pioneer, and others (including DJ brands), specify. The Audio Technica LP5 looks exactly what it is, a traditional Japanese design Direct Drive (hereafter DD) turntable of adequate torque, fitted with the kind of J-shaped pickup arm that Audio Technica used to sell separately as a variation of the SME 3009 styling concept. Indeed, the Audio Technica LP5 looks like a domestic version of the AT-120LP with a less pseudo-pro finish, and more audiophile friendly features. The DJ decks feature S-shaped pick-up arms a la Technics that are superficially similar to the various 1970's & 1980's 'British' rebranded Japanese OEM products, the Acos Lustre, Amstrad tp12 (oh yes) and Linn Basik, for example. Attempts at audiophilia seduction by the Audio Technica LP5 include 'Anti-vibration and damping materials used to minimise unwanted resonance' and a 'structure that has been engineered for minimum chassis resonance, while retaining a discreet look'. There's a '5mm Audio-Technica heavy damping rubber mat for improved low-frequency reproduction' too. Audio Technica was founded in 1962 by Hidéo Matsushita, as every audio website seems to copy & paste from the Audio Technica website. Hidéo Matsushita was an audiophile, who hand crafted stereo cartridges initially, like some other Japanese audio legends. 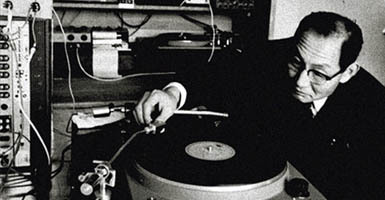 Hidéo Matsushita was also, at 42, the Director of the Tokyo Bridgestone Museum of Modern Art (where he staged a number of successful LP listening concerts), which he left to found Audio Technica. Richer sounds offer the standard Audio Technica LP5 plus AT95Ex at £329 (last month Richer Sounds charged £349). 'Never knowingly undersold' John Lewis have it at £329, which is about £80 above the street price for the AT120. It is a no frills modern Direct Drive (DD) turntable from an established Japanese brand. It is a good enough turntable for most purposes, but its limitations soon become obvious to sufferers of audiophilia nervosa. The flimsy construction is obviously resonant, the platter rings well enough for Anita Ward and the arm is more show than go. This is particularly obvious when the standard Audio Technica LP5 is lined up next to the more expensive The Audio Files AT-LP5 IPT. On The Audio Files AT-LP5 IPT, the stock black J-shaped arm is dumped and a new CNC laser cut Acrylic arm-board terminates an Audio Origami AO RB202 pick-up arm. The packaged cartridge is the justifiably long lived AT95E (not the AT95Ex variation that has a superior 0.3 x 0.7 mil stylus profile, as typically packaged in the UK with the Audio Technica LP5. The AT95Ex, which we did try, should reduce tracing distortion at higher frequencies, compared with the standard 0.4 x 0.7 mil AT95E stylus. Look forward to a treatise on the sound of stylus profiles here soon. The Audio Files hope that purchasers will realise the potential of the Audio Origami AO RB202 and head straight for The Audio Files Paratrace equipped version of the AT95, for an extra £99. All comparisons in this review used the same stylus swapped between decks and comparisons were made using all three stylus profiles. To be fair to Audio Technica, the AT LP5 costs less than many audiophiles drop on an interconnect cable. 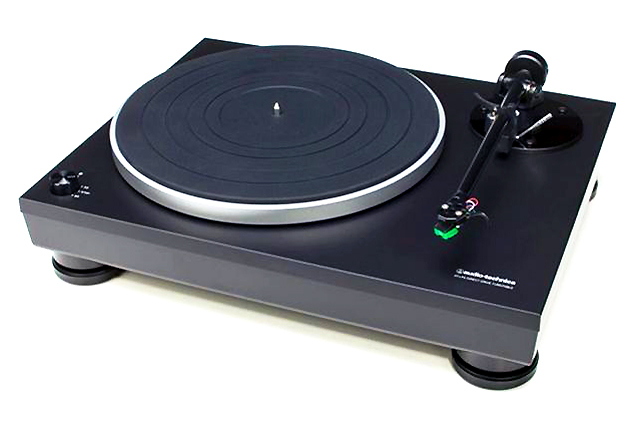 In context, a recent service on a Linn Sondek/Akito cost £1500 at a main dealer, for which the customer could have popped up the road to John Lewis and bought FOUR of the Audio Technica LP5 or TWO of The Audio Files AT-LP5 IPT direct from the maker. Both the Audio Technica LP5 and The Audio Files AT-LP5 IPT feature inbuilt audio circuit options. There is a direct output from the cartridge to the rear mounted phono pockets. There is an inbuilt phono pre-amp between the cartridge and the rear mounted phono pockets. This is an impressive functions list if they all live up to the rest of the deck. Because The Audio Files AT LP5-IPT retains the Audio Technica switchable internal phono stage and ability to digitise LP's using the supplied Audacity software, there's a versatility usually missing as buyers move up from entry level mass market stuff. Versatility can spell 'Jack of all trades but master of none' so the listening tests will consider this. Because this record player has audiophile pretensions, critical listening was through audiophile phono pre-amplifiers, the popular Trichord Dino (with upgraded outboard power supply) and the Canor TP306 VR+. Like every other area of analogue audio reproduction, fierce debates rage about the implementation of direct drive motor systems. Those in favour of sheer grunt argue that the motor controls the platter better if torque is high and the platter is low rotational inertia (low mass or lightweight). There are those who oppose high torque, who argue that a stable low-torque motor and controller significantly reduces cogging noise. Both sides agree that their preferred gospel affects the low end of the audio spectrum and pitch stability. DJ's love bass, but they also demand instant start-up so their preference for high torque-to-weight ratio is moot in the domestic audio arena. The Audio Technica LP5 has a starting torque quoted as 'greater than 1.6 kgf.cm', which for those in the SI world is 0.16Nm. This might look appealing to those who know the Technics SL1200 family, torque is 1.5Nm running torque. These figures cannot be compared because starting torque and running torque are defined by the control circuitry. Like so many other parameters, audio equipment manufacturers choose to ignore SI units and disagree on what parameters to measure and quote. 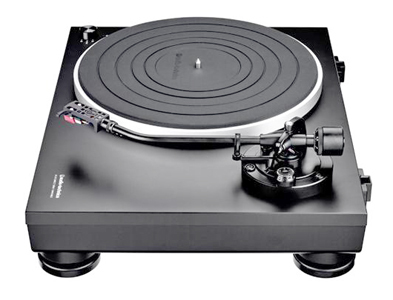 There is also a 12.5kg 3 speed £395 beast in the Audio Technica range, and the higher priced AT-LP1240 USB Turntable (nomenclature living off the Technics SL1200 & SL1100 legends) with an even wilder torque (Starting Torque: >4.5 kgf.cm) direct-drive 16-pole, three-phase motor at around £500. Some DD turntables with audiophile pretensions add heavier platters to existing direct drive motors, arguing that these smooth any cogging effects. Others counter that this will slow the cycle of speed correction, potentially inducing wow. A high starting torque to platter mass ratio is essential for deejays, the ubiquitous Technics reaches 45rpm in under 0.7s. Another Technics maintains speed (achieving virtually immeasurable wow and flutter) with only 0.06Nm (>0.6kgf.cm) running torque. As with so many aspects of audio, the figures are not much help identifying quality. Both the stock Audio Technica and The Audio Files upgraded version unpack quickly and build up with remarkable speed. Audiophiles used to unpacking, assembling, measuring bearing oil, bouncing springs, hairdrying arm cables in P-clips, centering arm-boards, torque wrenching motor bolts and other arcane esoteric rituals of the black disc, will be shocked at the speed and simplicity setting up either version of this deck. For those about to set up many so-called super decks, Audio Technica owners don't salute you, they laugh. The maker says, Fit platter to spindle, drop mat onto platter, balance tone-arm, and add 2 grams of VTF by rotating the AO RB202 weight one full turn, (1 gram per 180 degree of rotation) Plug in interconnect of your choice (a reasonable one is supplied), select on-board or off-board Phono EQ, attach kettle lead, and you are ready to spin some discs. This section is conflated from several listeners' notes. The first listening session involved an invited audience and their chosen reference records and their chosen bottled beers. The crew arrived for the intensive evening of Vinyl spinning in the listening room of the 'Old scribe' at the secret mountaintop lair of TNT Towers. Formalities were over with quite quickly, as this was a repeat of a similar evening a few weeks earlier where the Active Yamaha NS1000M had been auditioned. The formalities consisted mainly of deciding which bottled beer from the craft beer selection packs each was to use for our listening lubricant and what LP to put on the platter. "The opening track on side two, Stratus, on the fabulous 1973 debut Billy Cobham album 'Spectrum' is underpinned by a real groove of a bass line laid down by Lee Sklar, and Cobham's masterful and ground breaking drumming rolls and twists its way, serpent like, around this immaculate and rock solid groove, in a manner that must have been an inspiration and influence to Sly and Robbie in their later illustrious career. The turntable at this point immediately impressed by its un-erring pinning down of the timing of this complex musical interplay, where the metronomic bassline is brought into a classic Jazz Fusion tension by the minute and subtle chasing ahead, and slowing down of Cobham's complex rhythmically timed conversation with Sklar. Phew, we were certainly off to a great start" quoth one member of the assembled chorus. "The Old Scribe is being upstaged by his guests", note the Plebs' Chorus, stage left, "Who are already excelling at wine-speak purple prose, beyond the wit of Old Scribes!" "At one point, the lead guitar work by Tommy Bolin was, self evidently, emanating from well outside of the left hand speaker. A feat quite remarkable that the prosaic, if well respected, AT 95E cartridge was able to further enhance its giant killer status in this modest context, it could not have been more impressive than right here. More was yet to come on this, as we upgraded later to the red stylus assembly of the AT 95Ex profile that the AT LP5 ships out with as standard, to the universal opinion of the assembled that this dug even deeper, and laid even more detail out to be enjoyed and savoured" continued that enthusiastic listener. "Looks like cod shite sub Melody Maker verbiage", remarks the author of the above lines from their usual position on the Plebs' Chorus bench, stage left, on seeing their words in print. The sound did lack the tonal and dynamic breadth of more expensive front ends, but that is what higher spending audiophiles pay for. The lightweight construction of most OEM direct drive turntables has this effect. The effect is somewhat mitigated by the efforts of The Audio Files, who reduce the platter ringing with constrained layer damping. 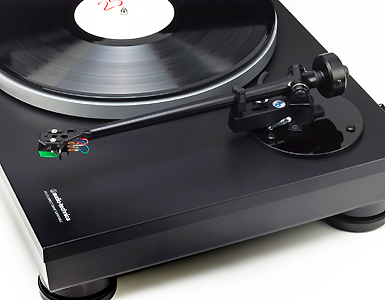 The Rega RB202 can sound a bit sterile and desaturated on other decks with other cartridges, but the Audio Origami AO RB202 improves this area and both are an order of magnitude better than the standard AT LP5 arm. The Audio Files AT LP5 IPT conveys the excitement of live recordings like Bowie's Cracked Actor 5 sided LP. It also does the acoustic space thing, to a degree, lacking the downward dynamic range of heavyweights, but still punching well above its weight. The limitations of the The Audio Files AT-LP5 IPT are exemplified by piano and orchestral music. Keith Jarrett's famous Köln Concert recording is enjoyable enough, but on the Orbe SE and the modified Linn the weight and dynamics of both piano and performance become more explicit. With the larger scale of the Beethoven Emperor (5th piano) Concerto the Orbe's lead extends beyond a mere cartridge length, digging through a dense recording. Rattle's Mahler 10 has the same restriction of scale on The Audio Files AT LP5 IPT compared with the Orbe SE front end that does cost enough to buy over seven of The Audio Files AT LP5 IPT. The soundstage scale of The Audio Files AT LP5 IPT nearly matches the width, beyond the speakers, but lacks depth and any illusion of height capability of decks like the Michell Orbe. The Orbe SE has authority and soundstage stability greater than most turntables at any price, so if that's a priority, prepare to dig deeper in the pocket than today's review specimen. The constrained layer damping applied to the platter, by The Audio Files, makes it possible to plonk vinyl directly on the platter surface. This was not rigorously tried because Rega derived arms are fiddly to correct VTA. However, several mats were tried and all simply imposed their expected character. The Funk Firm Achromat picked up the perceived pace and vitality at the expense of bass weight; a Linn felt mat added warmth at the expense of detail; the heavy AT mat added bass weight at the expense of transparency. This platter damping is so effective that different platter mats make less difference than on many aluminium alloy platters. The AT mat was good enough to stay in situ once the mat experiment was over. Counter-intuitively, this unsprung deck was less sensitive to supports than many sprung subchassis turntables and performed well on the Something Solid XR4 rack and the Origin Live Ultra wall shelf. Better mains wire than the supplied kettle lead made very little difference when an outboard phono pre-amplifier was used. No matter how gilded one's ears, the change would be imperceptible in a double blind test. When the onboard phono stage was employed, there might be a slight difference with an RF rejecting cable construction, but don't bet your shirt on being able to spot that difference either. Interconnect quality must be considered in the context of the internal wiring and socket quality. The atrocity that is visited upon every audiophile forced to use the truly execrable, live connects before earth/ground, RCA phono plug & socket, far outweighs the presence of a few oxygen atoms in a metre of copper, silver or pixie-dust treated unobtanium. Any of the TNT-audio.com DIY designs will be a good starting point. This review was conducted with a change from the usual resident DIY favourite, which had suffered from repeated abuse and was replaced with the supplied cable and a mid price commercial wire of good repute and easy electrical characteristics. The various stylus profiles available for the AT95 were tried. It is testament to the AO RB202 that their characters were obvious and consistent from groove to groove. The Paratrace is a parabolic profile offering extended vertical contact over the vanilla elipses, but a finer horizontal contact patch. This enables a more accurate trace of the finer groove-wall wiggles that determine the highest frequencies without increasing contact pressure. The Paratrace profile really showed the capabilities of The Audio Files AT-LP5 IPT and would therefore be a justifiable upgrade from the AT95E. The AT95Ex was an obvious improvement over the AT95E, improving treble clarity, transparency and sound stage scale and stability. The Audio Files Paratrace equipped AT95 went further into these and other sound quality improvements, digging deeper for subtle musical nuances and spatial information. High energy low compliance cartridges (whether moving coil or Decca London) might be less advisable because the arm board termination of the AO RB202 is not as inert as would be expected on decks (at least twice the price of this one) designed to carry that kind of transducer. The inbuilt electronics were tried. The RCA phonos on the back may be switched between line level and cartridge direct, depending on your system. The inbuilt phono pre-amplifier is scarily good for something that must have cost a fiver at most. There is also a 44kHz/48kHz sampling rate USB output. Knob feel isn't bad at the price, AT say "Ergonomic Start/Stop and speed selector with 33â…“ & 45 RPM selectable speeds" which means a three position knob like an old Thorens TD150. Everything feels solid, if a little light, to those brought up on heavy subchassis (or idler drive) turntables and whose only encounter with DD decks has been those screwed down into DJ booths. This would be a great starter audiophile turntable for someone adding vinyl to an existing good quality digital playback system, ready for a standalone phono pre-amplifier when funds allow. The obvious competition comes from Project and from Rega's own current variations on veteran models. Rega are now acrylic plinths while so many competitors use lacklustre MDF. Rega Planar2 Performance (resurrects the old name, before its RP2 transition period, includes Rega Bias 2 cartridge) at £460 and the Rega Planar 3 at £550, are obvious competitors, but neither have inbuilt phono pre-amplifiers nor USB outputs. There are myriad Project turntables in this price range, that have joined the Rega models as the de facto standards by which all others must be judged. They get thorough exposure in the UK press who report that they perform consistently. Many vintages of both Rega models are very familiar; they share the upbeat qualities of the The Audio Files AT-LP5 IPT but from memory, do not have quite the grip on rhythm enjoyed by The Audio Files model. The best endorsement for The Audio Files AT-LP5 IPT is that it stayed in the system the whole time it was here. Despite a modified Linn Sondek LP12 awaiting review, the usual reference Orbe SE and a Garrard 401 with Series 1 SME3012 competing for the privileged turntable shelf position, The Audio Files AT-LP5 IPT never felt beneath the task of providing a good enough source, even while playing with other components in leagues higher up in audiophile hierarchies. The retail price has to be remembered when listening to this upgraded mass market product. It has taken little added cash value to add considerable audiophile values to the basic and competant Audio Technica LP5. It is also a viable alternative to the dominant Western belt drive budget vinyl spinners, DJ's have long known that consistent coherent rhythm is more easily achieved via direct drive than via glorified knicker elastic. The Audio Files AT-LP5 IPT suffers a few sins of omission and even fewer of commission which are both forgivable and to be expected below a grand for an analogue front end. Classical pianists, and those familiar with Wagnerian grandiosity in the concert hall, may not find enough satisfaction, but rockers, be-boppers, dancers, dubbers and clubbers will be delighted. This is a big bang fer yer buck. If you are confined to your house, factory or office, go online to independent records shops and labels and buy vinyl; Don't waste time thinking about it. Just buy more stuff to play on your hifi!!! Take something previously unheard to your record shop counter and listen to it.